With Denver Comic Con, our first show of the season, almost upon us, the excitement is high and we’re very excited to start putting our books in the hands of readers. In anticipation of that, we want to share an interview our Editor-in-Chief did with the Reel Nerds podcast last summer at DCC. Ryan, James, and Brad are great guys who sit down and discuss a different new movie every week, as well as games, comics, and whatever else strikes their fancy. We’re very happy they took the time to talk with us about the show and our Uncanny Adventures anthology as we were getting it off the ground. Check out our chat with the Reel Nerds, and if you have a blog or news site that would like to talk to us about our projects or, well, anything, feel free to email press@8thWonderPress.com. With the book finally off to the printer, we are proud to announce that our latest collection, Uncanny Adventures: SCIENCE vs MAD SCIENCE, is almost here! SCIENCE vs MAD SCIENCE features the return of several contributors from last year’s book, including Mister V, Dan Conner, Whit Taylor, Jay Sternitzky and Mateo Cantu, Danos Philopoulos, Dino Caruso, Patrick McEvoy, and Owen Heitmann. We’re also thrilled to have many talented new creators with us, such as Ellie Fortune, Rich Foster, Nico Izambard and Nick Nall, Scott Schmidt, and Jeremy Shepherd and Mac Cooper. These are all of the talents behind the new book, though. We’ve got 18 brand new stories by 28 creators. It’s a murderer’s row of terrific comics, all wrapped up in a brand new cover by Ryan Dunlavey, the creator behind MODOK: Reign Delay and artist of The Comic Book History of Comics and Action Philosophers. We’re incredibly excited to bring this new book to you, and over the next several weeks we’ll be bringing you interviews with several of the creators to give you a taste of what’s in store. 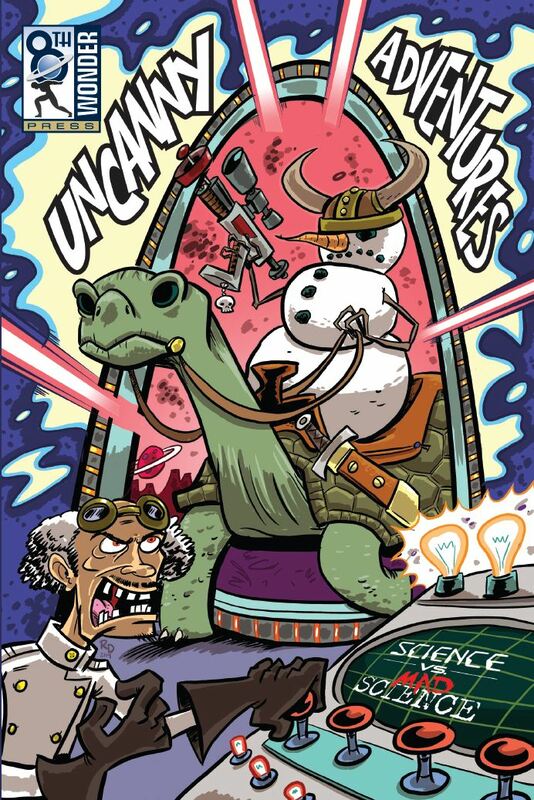 Uncanny Adventures: SCIENCE vs MAD SCIENCE will premiere at Denver Comic Con June 13-15, and will be available afterward on Amazon and at fine comic shops everywhere.